Elegant topaz glass plate with 8 sides made by the Cambridge Glass Company. Cambridge topaz is a yellowish-green transparent color of glass that is often referred to as vaseline glass. It glows a brilliant green color when under a black light (see picture below). Cambridge made this color of glass in the 1920s to early 1930s time frame. 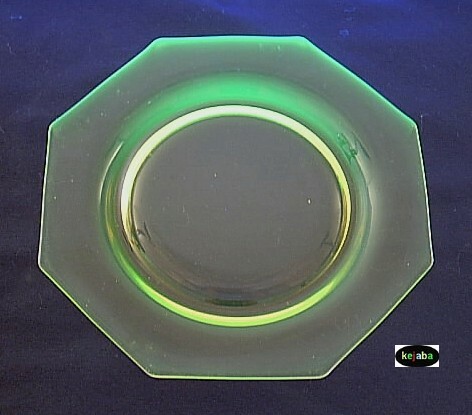 This plate with an opalescent edge is pictured on page 64 of "A Guide to the Magic Glass YELLOW-GREEN VASELINE" glass book by Jay L. Glickman, copyright 1991 and is listed as Cambridge. It measures approximately 7 3/4 inches across from smooth side to smooth side. 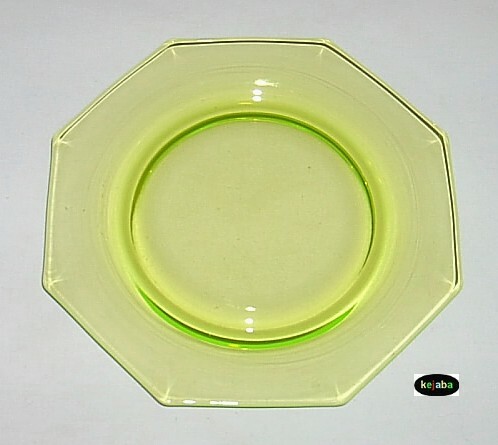 It has the manufactured ground and polished bottom typical of elegant glassware from this era. All items available in this listing have no chips or cracks and show little if any signs of usage.